Join us Second Saturday from 5-9pm for an exhibition of artwork from Pinellas County ESE students from Calvin A. Hunsinger, Paul B. Stephens, Richard L. Sanders, and Nina Harris schools. The cultural ideology of mask-making dates back to our humble beginnings as a community/colony, whether it be for ceremonial praises to the gods, reason for war, entertainment, or just sheer pleasure of make-believe. Identity, as a social construct and concept, tends to coexist between what is objective and subjective perceptions when pertaining to the human condition and all that entails within community. These students partake in communities that relate to family, school (peers, teachers), and social networking, with the possibility that each community they engage with will see a different identity, or façade from them. In, “These Masks We Wear”, these students pursue, engage, and internalize the epistemology of self-analyzation in two forms: creating 2D/3D masks utilizing paint, clay, and paper mache, and personal investigation and reflection utilizing photography, graphic design, and mixed media. These Masks We Wear is a student-led, visceral, visual concept meant to evoke the spirit of imagination with endless possibilities for the viewer. 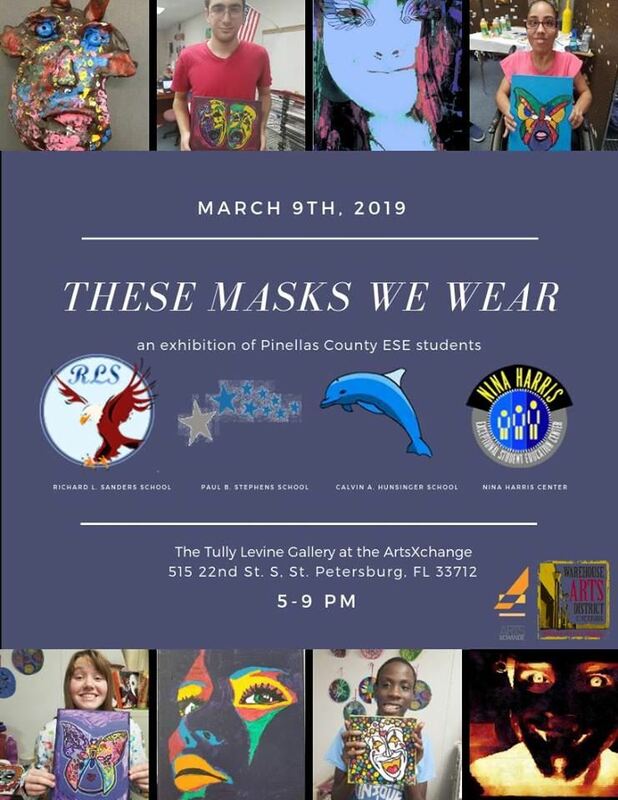 These Masks We Wear is a cohesive, exceptional exhibition created by students with disabilities attending Pinellas County Schools. The four Exceptional Student Education (ESE) center schools represented in this exhibit are Calvin A. Hunsinger School, Nina Harris ESE School, Paul B. Stephens ESE Center, and Richard L. Sanders School.